You may remember our Villa Park casita, where Anita and I lived last year, and which had the most disaster-fraught renovation in history. We rebuilt this little house completely, saving only the shell of the outside (the city required we keep the dimensions and roofline). We even installed a new, real, foundation to replace the three slabs with no rebar and no plumbing it previously had. We had a hard time renting it out last year, because we were unable to stage it once we moved to the Bobcat Lair, and people being unhappy that it shared the yard with the house in front. But, when we did get a fence and all that, we got some really great renters who were settling in nicely. One of them even got an award at the local elementary school. 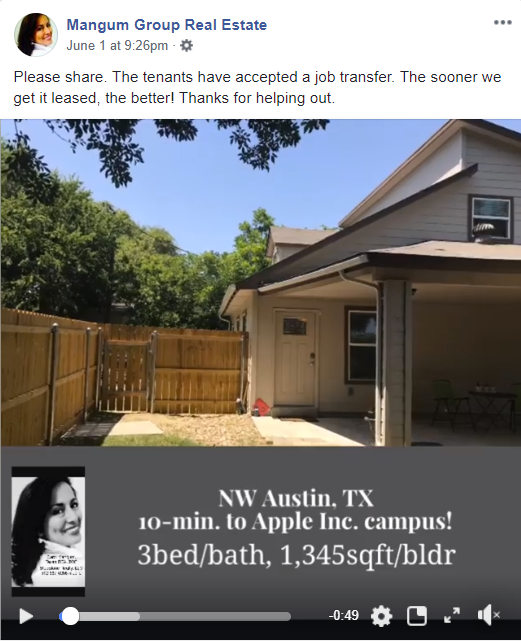 Unfortunately, the other renter got a great job promotion that required moving to scenic Bentonville, Arkansas (there are other companies besides Wal-Mart there). We certainly didn’t want to force them to stay, so Carol jumped on getting it rented again. You get a screenshot, because I can’t make it play here. Click the link to see it live, I hope. We all shared it everywhere we possibly could. People lined up to see the space (literally, four families went to see it in 15-minute intervals), and it was rented in just a few days to some other fine folks with no kids and no pets! Hooray! It worked because the tenants had decorated the casita nicely, which showed how well it “lived.” The current tenants cleaned it up (they were motivated) to perfection, so people just loved the place. That’s a real lesson to remember: staging truly helps sell or rent houses. I now really wish I’d done a better job the first time. We sure appreciate Carol’s hard work to get the casita rented so fast! Lee and I won’t even notice a drop in our cash flow. Win! One of our goals is to provide quality rental housing at an reasonable price. To meet that goal, we look for potential rentals with an ARV somewhere around three times the median income for the neighborhood. 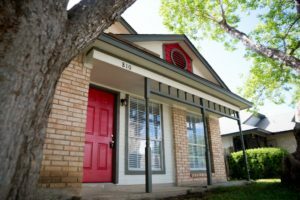 We think it’s important to have a diversified real estate investment strategy, so we have rental properties in addition to the houses we buy for rehabbing and resale. Carol and Russell have their own portfolio of rental properties, and Lee and I also have some. This is in addition to the rental properties we are building up for Hermit Haus Redevelopment. We spend a lot of time working together and providing feedback on our rental properties. As I’ve mentioned before, many of them have had air conditioning issues this summer, and there have been other issues causing team members or specialists we hire to run around the state keeping the properties up. Russell enjoys using his handyman skills and does a lot of the repairs himself. Check out those cars! Tenants can make it difficult to show a house. Most of the time, we sell our properties when they’re vacant. If at all possible, it’s often better to wait until the tenants vacate the house before listing it. However, that’s not always possible, especially when the plan all along was not to sell it right away after the rehab. Unfortunately, my friend’s story is not that unique. A quick search found many, many pictures like this one on the Internet. It’s a sad truth of today’s world that we all must be constantly vigilant against scams, from state-sponsored hackers to opportunistic cybercriminals. To that end, I wanted to share a story from a fellow redeveloper’s Facebook page. DJ finished a renovation and had just begun marketing it. She placed a For Sale sign with her phone number in the front yard. That’s just good marketing. It’s also what saved at least one family from falling victim to a scam. 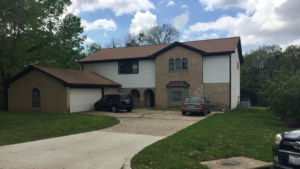 The scammers took the information from DJ’s Zillow listing, including the pictures. They then ran a Craigslist ad with the address and pictures saying the property was for rent. All anyone had to do was send $1600 to an out-of-state PO box, and the keys would be overnighted. No hassle, no fuss. Except that the PO box didn’t belong to DJ or anyone she knew. Anyone sending that money would be out $1600, money they probably needed very much. One potential victim was a Marine relocating to the area. Thankfully, the Marine drove by the house and took down DJ’s number from the sign. Triggering to the conflict between the rental ad on Craigslist and the For Sale sign in the yard, the Marine called DJ to get the real scoop. Several other redevelopers noted that similar scams had been perpetrated using their properties. One said one of their kids almost fell for a similar scam when looking to move out of a dorm. It saddens me to think that humans can be such predators on their own kind. Why can’t we take better care of one another? To anyone thinking of renting a property, be aware. No legitimate landlord asks for the money up front and overnights the keys without some form of due diligence on the prospective tenants. There are rental applications and background checks, but these hurdles also protect renters. I strongly suggest you never give up your money without first meeting with the landlord or the landlord’s licensed agent. 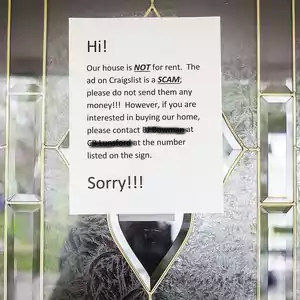 Finally, Craigslist has a page devoted to helping you avoid being scammed. So does Fraud Guidelines (which, despite its name sounding like a set of recommendation for scammers, is a helpful site).